We are very excited to welcome you to The first Aston Baker Global Symposium, will be held March 30-31, 2019 in Bogota, Colombia. Doctors from all over the globe will have access to the best training and the brightest minds in cosmetic surgery. Experts will show their cutting-edge techniques & procedures for all to see. The first Aston Baker Global Symposium, that has an exclusive and exceptional educational experience for surgeons who want to take their practice to another level with the fastest and most efficient method of information transfer through real-time observation of surgical operative cases. All you need is a High-Speed internet connection. High level curated content by Dr. Aston and Dr. Baker with a mix of International and U.S Plastic Surgeons operating out of Bogota, Colombia will now be available to you directly in your very own private viewing session. 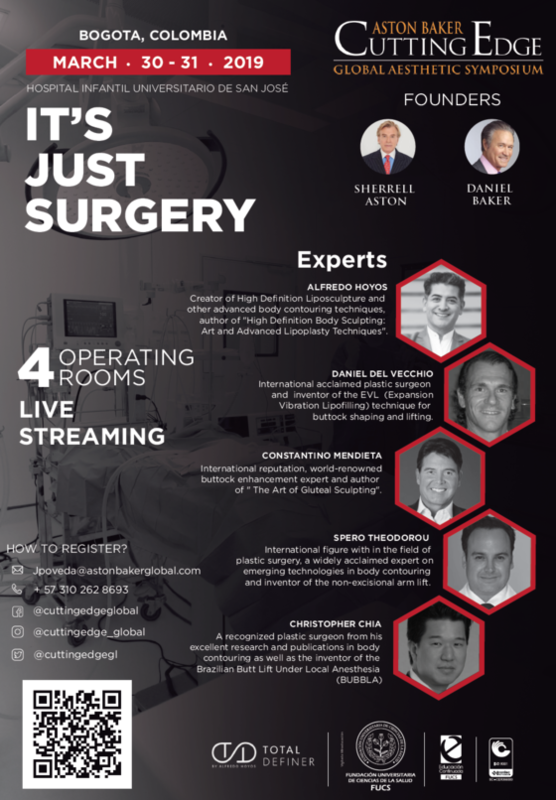 Utilizing exclusive live streaming technology for the very first time in a plastic surgery meeting, you will now be able to enjoy and learn all the key points for every operation through your laptop or cell phone all in the comfort of your own living room. This global live stream event will be open to all specialties and nationalities and will have an anticipated reach of 350,000 physicians involved in the practice of aesthetic medicine and surgery globally.